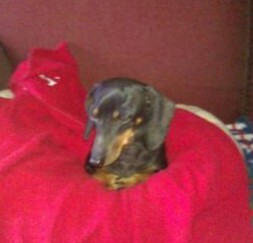 Our Miniature Dachshund went missing back in 2007, after hundreds of flyers and searching for two years we finally came to the realization that our “Velvet” was lost forever. Not knowing what happened to her led to long nights thinking about her. I got a call from the Albuquerque Animal Services today and at first I thought it was a prank call. Wow! I went to the shelter and after verifying all the information she was released to me. Animal Services didn’t realize they just found a dog missing for over 5 years. My wife didn’t know and I should have video taped the reunion between them when I got home. It was so emotional! I immediately took Velvet to our vet and they were so happy too! We talked about all the missing pet posters on their wall and how they should never give up hope even after 5 YEARS! Thanks so much HomeAgain! Chip Chip Hooray!